It always amazes me how I never seem to run out of product to try from Love Lula. I face the restrictions of allergies, yet I still manage to fill my basket. I've a lovely selection to tell you about so lets crack on. Just as a heads up everything here is suitable for Vegans and free from linalool (an ingredient that natural occurs in essential oils and happens to be one of my allergies). If you're a regular reader then you'll know I adore Crazy Rumors lip balm but I hadn't tried any from their tinted range. I'm not much of a lipstick wearer so thought this would be my perfect lip product. Coral is described as medium neutral pink which I would agree with. It's sheer and provides a wash of colour with a hint of shimmer. I was won over straight away. Very easy to wear and all the benefits and flavour you'd expect from this brand of lip balm. A new-ish brand for Love Lula and it caught my attention because some of their products are free from essential oils. The Glow Face Souffle appealed to me based off the ingredients of shea butter, baobab and jojoba. This is a super rich formulation thanks to the shea butter but in all honesty it's far too intense for my face and that saying something given my history with eczema. In order not to waste an great formulation I'm loving this as a body butter as it tackles dry skin with ease. I certainly would champion this brand on the basis of simple but effective ingredients and for offering a fragrance free solution for consumers with sensitive skin. 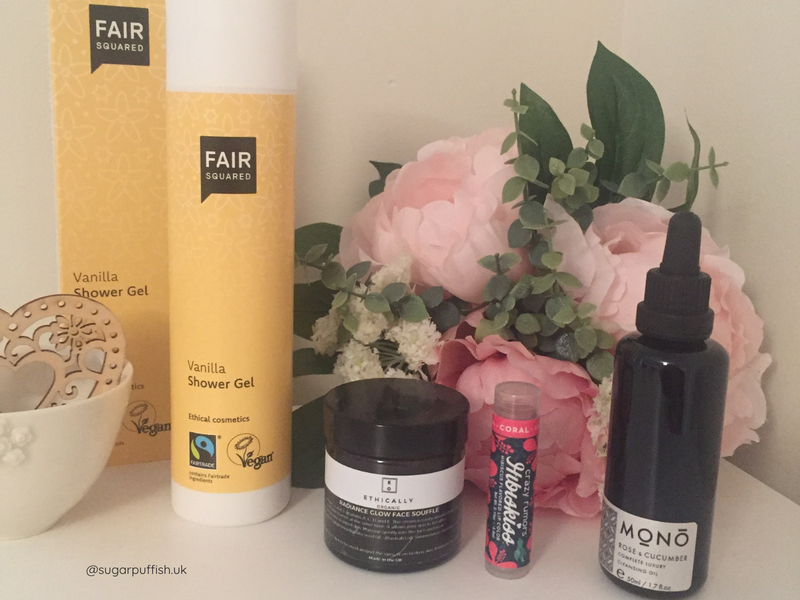 I've spoken about Fair Squared in the past and it's an interesting brand. I consider them to be family friendly and their range includes skincare but also extends to intimate items such as condoms and period cups. The vanilla shower gel is suitable for the entire family and formulated with Olive oil to gently cleanse and moisturise the skin. The scent is delicate and reminiscent of foam ice cream sweets; it's very pleasant without being over powering. It's nice to see a formulation without an overly lengthy ingredient list. The consistency is runny and low foaming which is to be expected. I was initially attracted to Mono Naturoils Rose & Cucumber Cleansing Oil because it ticked a couple of boxes for me. Firstly, no essential oil allergens and secondly a blend of ingredients which personally appeals to my skin type. There is no escaping that Mono is a luxurious brand with packaging and prices reflective of that image. This cleansing oil is light with a delightful delicate scent, its the cucumber that hits my senses first followed by undertones of rose. If you're a fan of Mallow + White Soothe cleansing oil (as I am) then this one will also be an instant hit. Mono Naturoils Rose & Cucumber Cleansing Oil is an absolute pleasure to use and it turns your cleansing routine into a ritual that you don't want to skip.